To me, there are some books that are essential, required reading to continue living and breathing on this earth. It doesn't matter if you're a sci-fi/fantasy geek or not, these books should be read by everyone because they are so absolutely brilliant and amazing. There are not very many books like this out there. 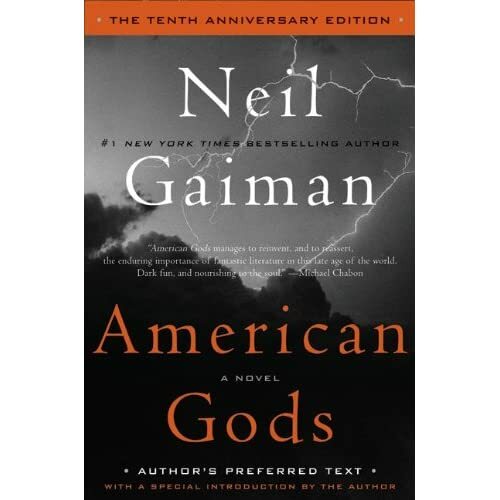 Neil Gaiman's American Gods is one of those happy few. There is no book as teeth-rattlingly, mind-bendingly, breath-takingly EPIC as American Gods is. 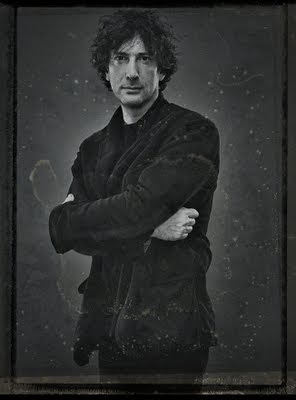 I'm not just saying that because I'm a huge fangirl of my future husband Neil Gaiman. I truly do believe American Gods is one of the finest pieces of writing I've ever read (and I have a degree in Literature, so I'd know!). Yesterday marked the tenth anniversary of the publication of this seminal work. It's a modern day classic written by one of the best writer's in the business. I remember reading it when I was in high school. I sped through it in one day. The moment I finished it, I opened it back up and started to re-read it. I manage to re-read it about once a year or so and every time it gets better and creepier and more amazing. I notice things I hadn't seen before and marvel at Gaiman's deft ability to weave a story so complex and yet so wonderfully simple. The novel is about an ex-con named Shadow. Newly released from prison, he finds out that his beloved wife has died in a car accident. With nothing else to really live for, Shadow accepts a job from a strange man and he begins an adventure full of danger, intrigue and self discovery. Each character in the novel is completely fleshed out and interesting, even if they appear for only a page or two. Every twist and turn the book takes is somehow so deeply satisfying. The major premise of the novel, without giving too much away, is the idea that immigrants to America brought over their gods and, after years of adopting the American lifestyle, abandoned them in this strange land. Once powerful gods try to get by with odd jobs like driving taxis or working in factories. The heady mixture of questioning faith and flawless mythology that the book has is nothing short of thrilling. Torn straight from the pages of Bulfinch's Mythology, these mighty gods have been humanized and given fresh new angles. It's almost magical how Neil Gaiman mixes his astronomical knowledge of mythology with his incredible storytelling skills. This may sound like intense flowery praise, but American Gods has earned it. I own several copies of American Gods. The original hardcover, two different paperbacks, the audiobook and even a small diary that Neil kept as he wrote the book (the out of print Adventures in the Dream Trade). It's the book I most frequently lend my friends and the one I use as an example of innovative storytelling. There's just something about it that seems larger than life. Even though I know how it ends, I'm always breathless as I reach the final chapters. Recently, it's been announced that Tom Hank's production company has optioned American Gods to be made into a six season TV show. I'm not so sure how I feel about that (though that is a rant for another article). Six seasons seem like a lot to get out of just one novel and Neil has said, on his Twitter, that a sequel to American Gods might be in the works. I am so incredibly excited about even the mere thought of it. In my eyes, Neil Gaiman can do no wrong. From the incredible job he did with an episode of Doctor Who, to the chilling and delightful Graveyard Book and Coraline, not even taking into account the hysterically funny Good Omens book he wrote with Terry Pratchett. Neil is a master of his craft. American Gods will always be one of my favorite books. It is, without a shadow of a doubt, essential reading for everyone. The tenth anniversary edition with preferred author's text has just been released and I beseech you to pick it up if you haven't. Buy it and put it on one of those e-reader abominations. Grab a good ol' paper copy. Take it out from the library. Something. Anything. Just make sure you read this novel. Do you like mythology? Do you enjoy epic adventure stories? Do you have a pulse? Are you breathing? If you answered "yes" to any of the above questions, American Gods should be the next book you read. One of the things that makes this site great is the varied likes and opinions of the authors. By which I mean to say, I found this book to be adequate but not wonderful or even that groundbreaking. It was hyped to the skies when I picked it up and I remember thinking, "Well. That was... okay." In fact, I've never gotten the overwhelming fangasm response to Gaiman. He's a good author, but nothing I've read of his has ever struck me as anything revolutionary or even that memorable. Maybe I've been reading the wrong things of his? You've read Good Omens, right? That was AMAZING. I don't know how much was Pratchett and how much was Gaiman, though. Hmm, I have not. I shall get it now. I started with Good Omens, then read Neverwhere and American Gods (also read a lot of short stories and Anansi Boys too - the short where Shadow battles Grendel is one of my favorites). Laurie, You know, I wasn't a huge fan of American Gods either. But I love Neverwhere, Coraline, and Good Omens. Definitely add Coraline to your list. It's one of the creepiest books I've ever read and it's for little kids! I enjoyed the movie but the book is so much darker. Huh. I've owned this book for 3-4 years, ever since I found the hardcover in a thrift store. I am a tried-n-true Gaiman fan since Sandman issue #8 (AKA the "big breakout" issue). I snatched this up... but never read it. I admit.